The ancient town of Bishop's Castle is an area of outstanding natural beauty and has architectural styles dating from the 15th century. Our 3 select holiday homes are in the grounds of our large Victorian house close to the centre of this small market town and the historic Three Tuns Brewery and public house. 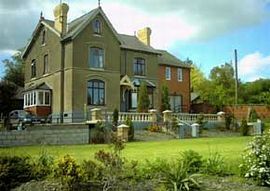 The accommodation is ideally situated for exploring rural Shropshire, Herefordshire and the Mid Wales borderlands. 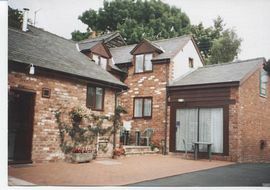 Mediaeval towns of Ludlow and Shrewsbury, the world famous Ironbridge and the walking country of Offa's Dyke, Long Mynd, Stiperstones and Wenlock Edge are, but a short drive away. Activities available close by include gliding, fishing, golf and horse riding. GROOMS RESIDENCE: Beamed lounge with cosy fire place and dining area, small kitchen and ground floor shower room. A pretty double bedroom is on the first floor. A small romantic hideaway for two. COACH HOUSE: Adjoining the Grooms Residence, this property has two bedrooms, one double and one twin, lounge with patio door, dining kitchen and ground floor shower room. GARDEN COTTAGE: Suitable for a small party or family, adjoining Claremont House, this had one double, one twin and extra sleeping downstairs if required. Lounge with patio door to garden, dining kitchen and upstairs shower room. Lovely views over the Shropshire countryside. Delightful cottage for up to 6 people. Lovely views over the Shropshire countryside. Pets allowed by prior arrangement only. Large lawned garden suitable for children. Patio areas with garden furniture. Local Services: Close to shops, public houses and restaurants. On reaching the Bishop's Castle town sign,turn right,up the hill and right again into Bull Lane. 30 yards on, the property is the first on the left signed Claremont Holiday Cottages. Low season: from £170.00 - £275.00 per week. Mid season: from £210.00 - £350.00 per week. High season: from £250.00 - £400.00 per week. Short breaks: from £120.00 - £250.00 per stay. Please see our website for all details, prices and availablity.